Property Info: 2 Bedroom, 2 Bathroom Condo with 800+ sq. 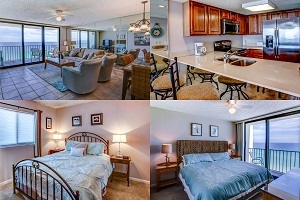 ft.
South Walton beach home, One Seagrove Place condo for sale. Beachfront Condo in a very desirable location. This is only the 2nd residence for sale in One Seagrove Place this year. This 14th floor gulf-front home has incredible views of the Gulf of Mexico. The kitchen and living area have been nicely renovated with new appliances and furnishings. One Seagrove Place is located in a highly desirable area on along Scenic Hwy 30A, between Seaside and Rosemary Beach. Come see this amazing beach home at One Seagrove Place Condo in 30A-South Walton Florida.